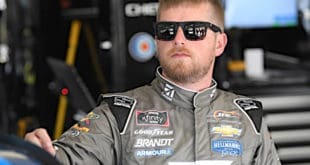 When GMS Racing put Timothy Peters on the Talladega Superspeedway entry list for the team’s No. 25 truck, he immediately became someone to beat. 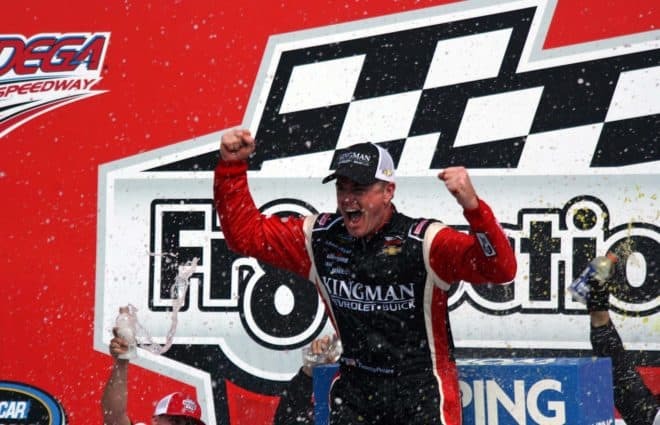 The former full-time Camping World Truck Series driver is a 10-time winner in the series, including two at Talladega. Make those numbers 11 and three, as Peters won the FR8Auctions 250 on Saturday afternoon (Oct. 13) in just his fourth race of the season. 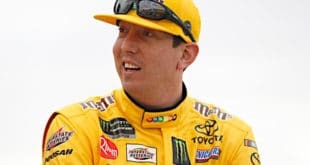 Peters said when the team first called him from Canada to drive the truck, they could see his smile from Atlanta, where he was trying to get his passport to run the race north of the border. Peters previously drove for the Red Horse Racing before the team closed its doors early in 2017. 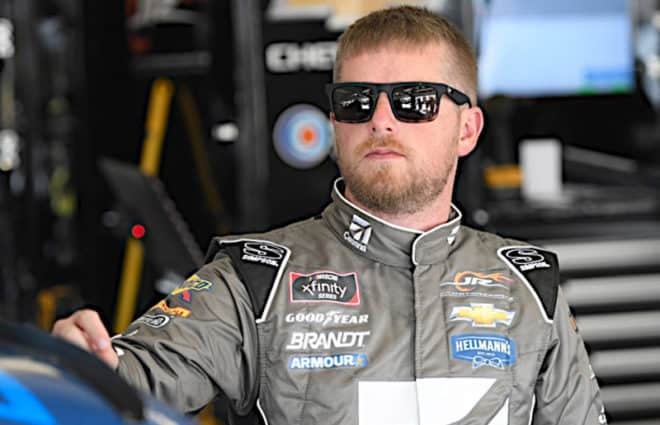 He had seen limited action in the series until he wall called on to run three races for GMS following Dalton Sargeant’s departure. 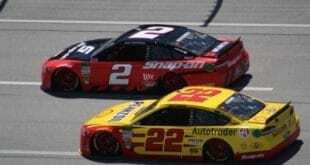 “It was really special, to not knowing what your plans are after May 2017 … to run the next three, and it’s three tracks that we’ve ran well at, and to come to Talladega and to know that, their program is strong in general, but they’ve won just about every superspeedway race that I can remember,” Peters said. “I knew if I kept my head on straight I had a shot to win. Peters pushed Noah Gragson around Justin Haley for the lead with four laps to go. Then on the final lap, Gragson blocked a run from Peters and spun into the wall. Peters avoided the wrecking No. 18 and held the lead as the caution flag ended it. Peters told Frontstretch before the race that this was his final race of the season and he currently didn’t have any plans for 2019. Myatt Snider was the runner up, his best career finish. David Gilliland finished third and Haley was fourth. Wendell Chavous, in the final start of his Truck Series career, rounded out out the top five — the first such result of his career. The race was the cutoff for the Round of 8. Johnny Sauter, Brett Moffitt, Gragson, Grant Enfinger, Haley and Matt Crafton advanced, while Stewart Friesen and Ben Rhodes were eliminated. None of that came without incident. 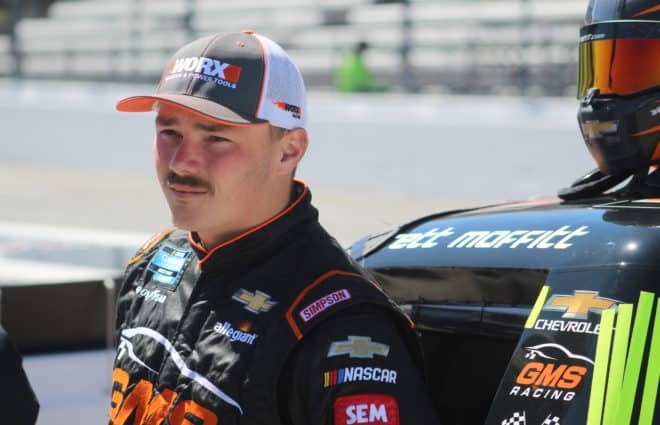 Moffitt limped to a 17th-place finish after making contact with Tanner Thorson with 2 laps left in Stage 2, resulting in a flat tire for the No. 16. Moffitt’s team spent most of the stage break making repairs to the team, but continued running. With 15 to go, Moffitt suffered from another flat tire, but finished the race and moved on to the next round. 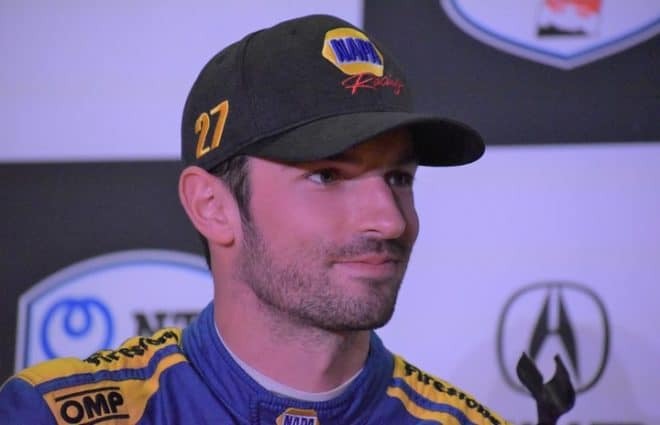 Friesen had a fast truck, but at the start of the final stage, his engine started having problems, giving him difficulties in keeping up with the lead draft. The team looked under the hood during a pit stop, but couldn’t figure out what was wrong. He still managed a sixth-place result, but it wasn’t enough for the Round of 6. On lap 61, the Big One happened, which gave Crafton a playoff scare and ultimately knocked Rhodes out of it. Haley got a run on Chris Fontaine’s No. 47, and Fontaine went for the block. It was too late, and it caused a massive pileup that damaged Sauter and Rhodes and took out Crafton, Spencer Gallagher, John Hunter Nemechek and Parker Kligerman. “We had the momentum and the [No.] 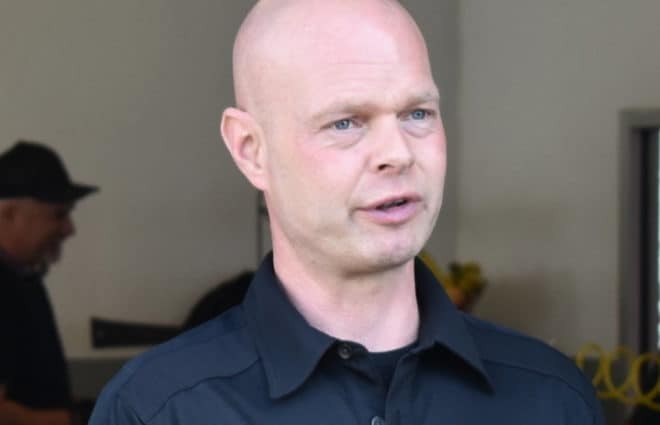 47 turned himself,” Haley said about the incident. The wreck nearly knocked Crafton out of the playoffs. Crafton finished the race in 26th and made it to the next round by four points. Rhodes, on the other hand, finished 16th — not enough to advance to the next round. One of the feel-good stories at the start of the race was the father-son duo of David Gilliland, who won the pole for the race, and Todd Gilliland with their matching Pedigree paint schemes. After the Big One, the pair took the lead, as David led on line and Todd led the other. 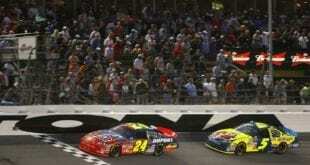 Enfinger thwarted the Gilliland’s day twice. He moved around the two of them to take the lead, and with 12 laps to go, Todd Gilliland bumped Enfinger, who then came down on the younger Gilliland and sent him into the inside wall. On the restart with six to go, Enfinger got too big of a lead, and when David Gilliland got back to him, the elder Gilliland spun Enfinger. David Gilliland said it wasn’t payback for Enfinger wrecking his son, and that both situations were three drivers going too hard for the win. The move damaged Gilliland enough so that Haley got around him. Haley ultimately lost the lead to Gragson, who lost it to Peters on the backstretch of the last lap. The Truck Series has an off week next week before heading to Martinsville Speedway to begin the Round of 8.